If I had to write a list of my all time favourite beauty products, MAC's Soft & Gentle Mineralize Skinfinish would 100% make the cut. 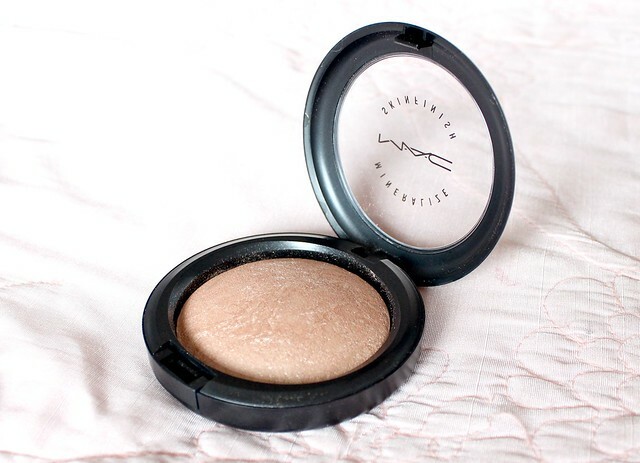 As one of the first MAC products I tried a few years ago, its gained a special place in my makeup loving heart and has become one of my 'holy grail' products. The reason I've never reviewed this product on my blog before is because I've never owned a new one that's been in pristine condition for me to photograph. Yes, that's how much of a perfectionist I am. There's just something about photographing old and tatty products that just doesn't do it for me. However, as I got a new one for Christmas, I thought it was about time I shared my thoughts with you all. Okay, so where do I start with this product - there's so much to say. Basically, if you don't know what it is, its a metallic finish mineral powder that's used for adding that much coveted glow to the skin. Its a highlighting product that can be used anywhere you want to add some radiance to your face or body. The reason I love it so much is because it highlights my skin unlike any other product I've ever used. The powder is very finely milled and exceptionally pigmented so I only need to dab my brush very lightly on the powder to achieve the desired effect. With this being said, this product lasts an absolute lifetime. My first one lasted almost two years and I used it nearly every day so its definitely worth its pricey £22.00 price tag. MAC describe the shade Soft & Gentle as a 'gilded peach bronze' and although I agree there's hints of peach and bronze running through it, I'd say its more pearl/champagne toned with hints of pink in there too. As you can see from the photos above, its a beautiful shade and you can see the various tones running through the stunning mineralised pattern in the pan. I'd say this shade is completely universal and would suit all skin tones but if you want something slightly darker and more on the bronzed side, MAC also offer another MSF called 'Gold Deposit'. I've tried that one too and although its too dark for my skin when it isn't tanned (although its a good en for Summer), its a beautiful product and would work perfectly with medium to dark skin tones. I like to use the skinfinish after doing my foundation, concealer, powder and bronzer as I find its the perfect finishing touch and prevents my face from looking 'flat' if that makes sense. Basically, it adds another dimension to my skin and a glow that I can't achieve from any other product. The name skinfinish is a perfect way to sum it up as it truly is the perfect finishing touch to any makeup look and can be worn both day and night. I like to apply it to the tops of my cheekbones, down the centre of my nose and a light dusting across my forehead as this brightens up my whole complexion and makes my skin look really healthy. I also like to use it on my collarbones and down the front of my legs if I'm going out and it can also be used to highlight the brow bone, inner corner of the eye and cupids bow. As you can see, its quite the versatile little product and you all know I'm a sucker for a multi-purpose product. A few other reviews I've read say that its quite a glittery powder but in my opinion, I wouldn't say its glittery at all. Metallic yes but glittery, no. Instead I find it gives a nice dewy sheen to my skin. Whenever I wear it I feel like my complexion looks ten times better and I look much more radiant and fresh. As I said earlier, its definitely the best highlighting product I've ever tried and trust me, I've tried my fair share. 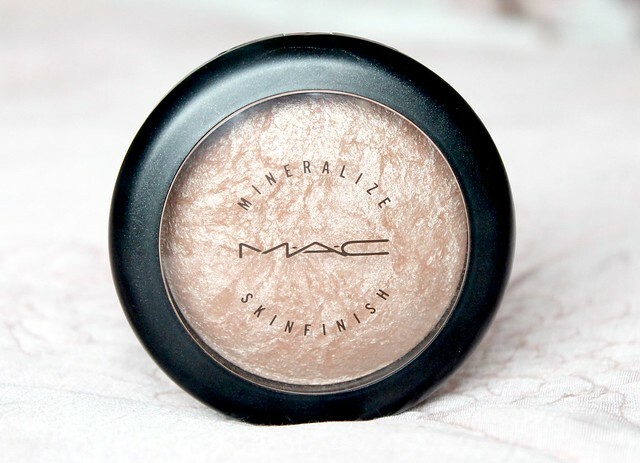 If you're looking to add a highlighter to your makeup collection, look no further than the MAC MSF. I don't have a bad word to say about it! 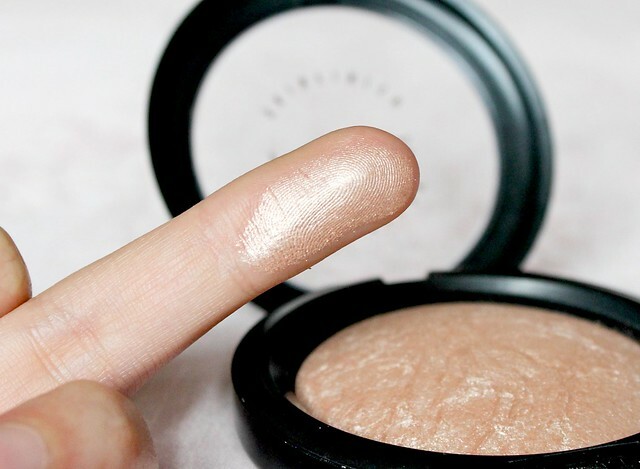 Have you tried the MAC Mineralize Skinfinish? Do you love it as much as I do? Its available to buy here. You photographed the product beautifully! Soft & Gentle has been on my wishlist for ages, I'm pretty sure it'll be my next MAC purchase, it's just so pretty! I've heard loads of great reviews on this, I definitely need to buy it soon! 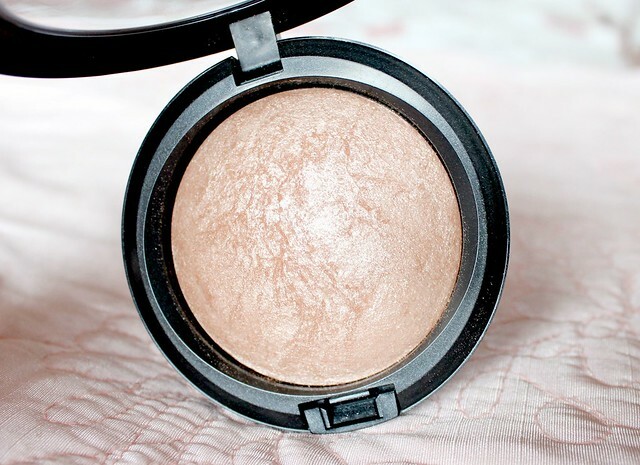 I use, and love, Lightscapade which is just beautiful on paler complexions! I've definitely been meaning to pick up this one as well though as I've only ever heard rave reviews about it! One of my favorite highlighters! It's beautiful! Landed high up on my wishlist just now. wow this is absolutely beautiful, want!! I love MAC soft and gentle! It gives my skin the boost it needs after I finishing apply my base etc. It’s so pretty and I often get asked what Im wearing on my face, when wearing this product! I also really like theBalm’s highlighter - I have written a review over on my blog. Its so finely milled and great for those with a paler complexion! As you can tell I’m a huge lover of highlighters! I really need to own this like right away! I've just written my January in Review post for my January hits and misses, check it out on my blog. I've heard so many amazing things about this highlighter, I really need to pick it up. This was the first MAC product I got and I adore it! It lasts for so long as well, I've had my current one for over a year and it looks hardly touched. This product is on my to buy list! I've been wanting to try it for a while now, but just kept forgetting about it while at the MAC counter...I know odd. I love this product so much. It's definitely worth every penny! wow i never knew this product even existed looks amazing. great review i will defiantly look out for it when i go shopping! This is soo stunning, I must get my hands on this! You should really try Makeup Atelier Paris products. I am so in love with them. Far better than Mac. and give me some useful tips which would be much appreciated! Thank-you!! 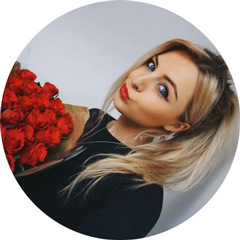 I've completely fallen in love with your blog! And this post, amazing. It's so detailed, you've basically covered everything that I need to know and your photos are always at their best quality. Again, thank you for such a great post! This is forever on my list of things I'm lusting after! I agree with you that this powder will last a lifetime! I only need to use the smallest amount to cover all the areas I want covered! I barely made a dent in it! I'd say for anyone looking to invest in it, you'll get your moneys worth out of it!